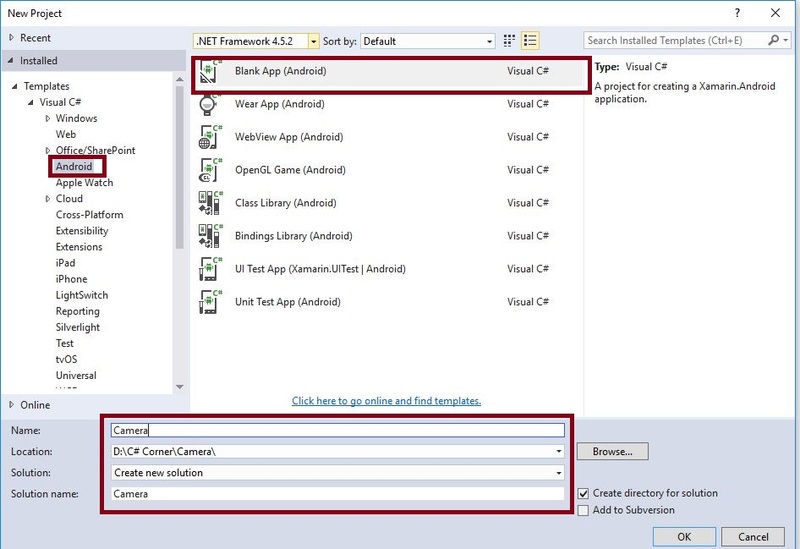 Step 1: Open Visual Studio->New Project->Templates->Visual C#->Android->Blank App.Then, give Project Name and Project Location. Step 2: Next, go to Solution Explorer-> Project Name-> References. 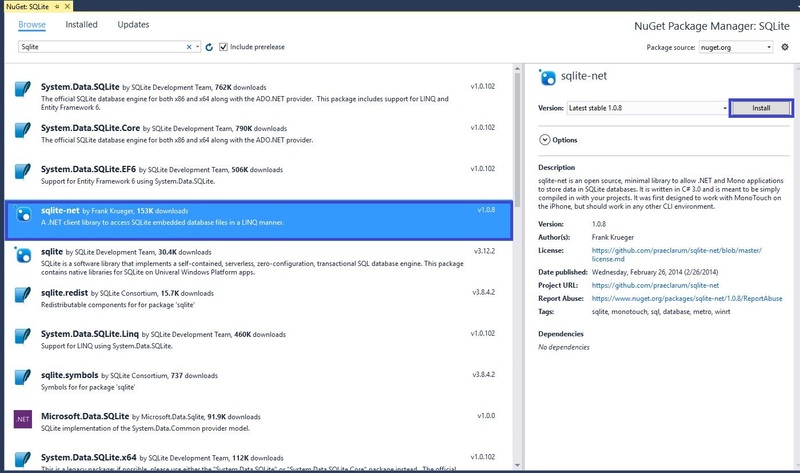 Right click to Manage NuGet Packages and open a new Dialog box. In this dialog box, search for SQLite. Then, install SQLite-net Packages. 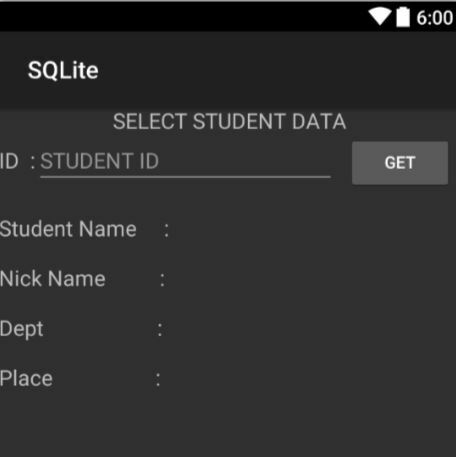 Step 3: Now, we need to create a database table so that we can create one data layer class. Go to Solution Explorer-> Project Name and right click to Add. Open a new Dialog box. 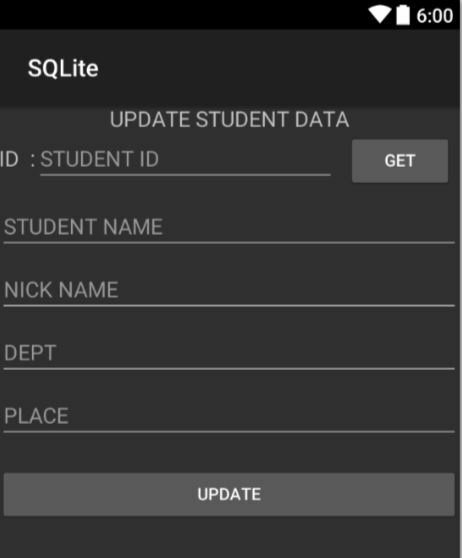 Then, select Class and give it a name, such as, StudentTable.cs. Click Add. Step 4: The next step is to Open Solution Explorer-> Project Name->Resources->layout->Main.axml. Click on Open Design View. Here, create four buttons. 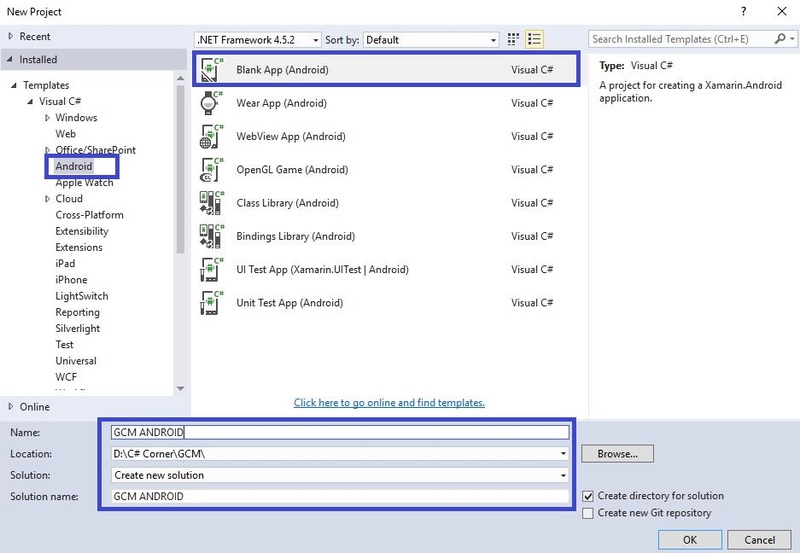 Step 5: Next, Open Solution Explorer-> Project Name->StudentTable.cs. Click on Open CS code Page View and create table columns. 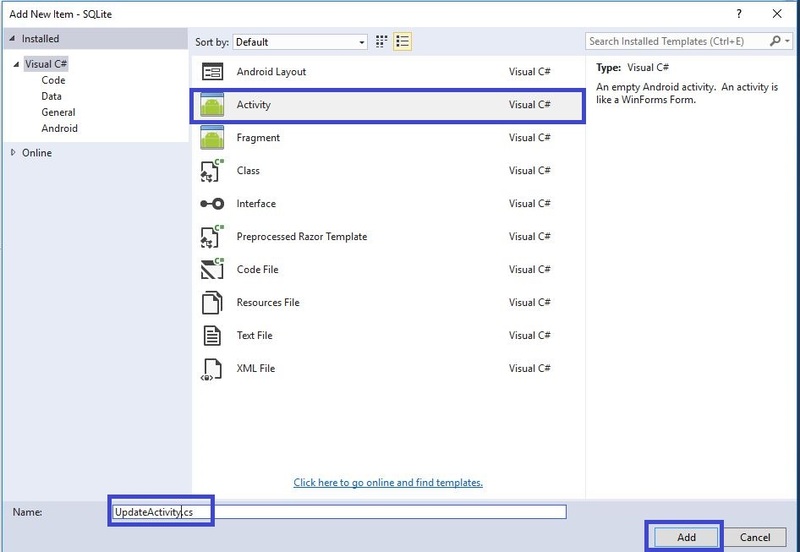 Step 6: Now, open Solution Explorer-> Project Name->MainActivity.cs. Click on Open CS code Page view. Then, add the following namespaces. First, we create Database. So, after OnCreate(), create a new method named as CreateDB(). 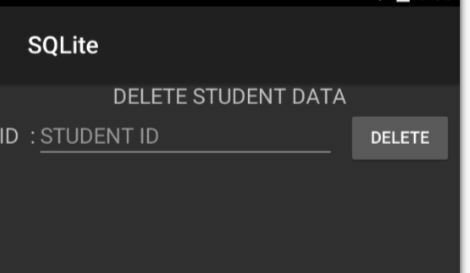 Here, Database Name is “student.db3”. Step 7: After this, create Main Page. Insert new layout for insert operations. 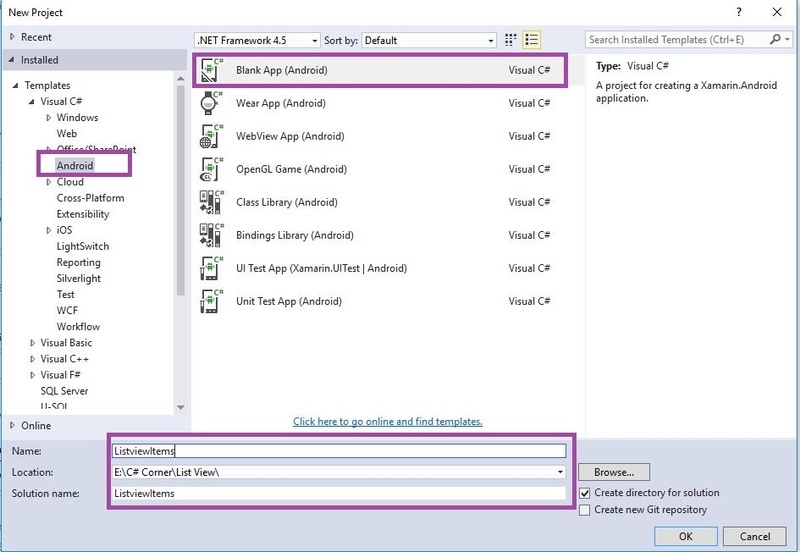 Next, Open the Solution Explorer-> Project Name->Layout. Right click on Add, and open new Dialog box. 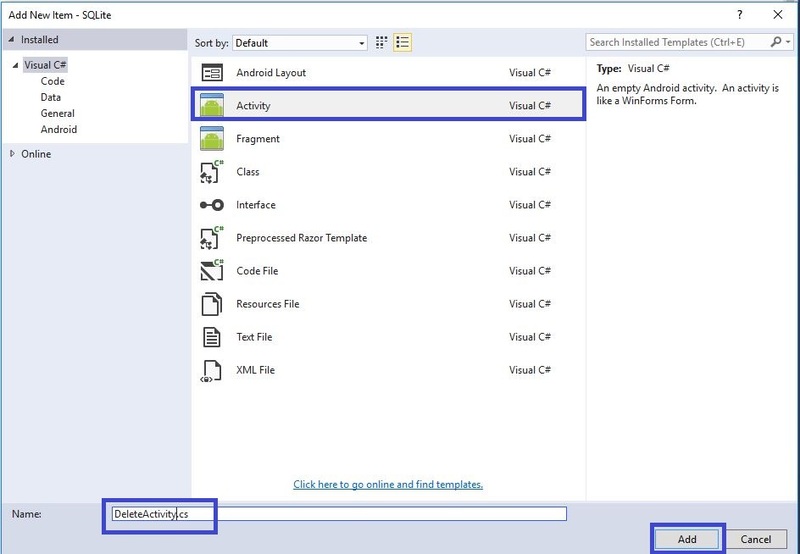 Then, select Android Layout and give it a name as Insert.axml. 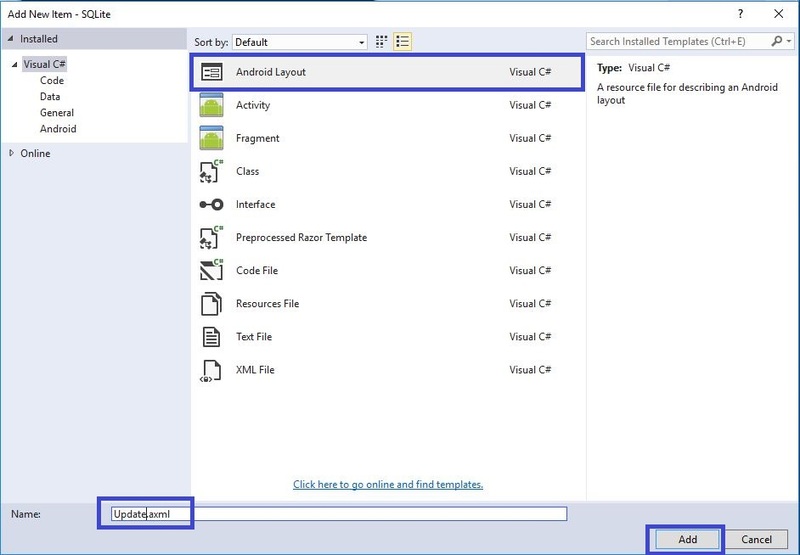 Step 8: Next, go to Solution Explorer-> Project Name, right click on Add, and open a new Dialog box. Then, select Activity. Give it a name as InsertActivity.cs and click on Add. 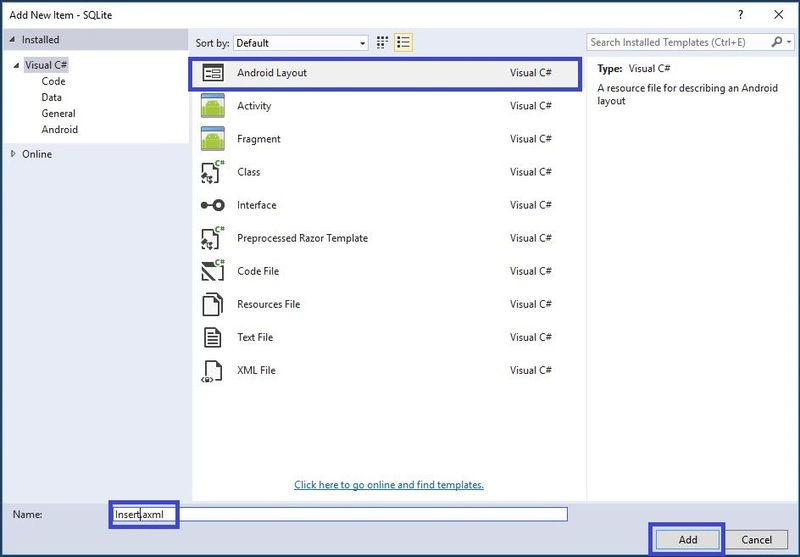 Step 9: Next, open the Solution Explorer-> Project Name->Resources->layout->Insert.axml. Click Open Design View. 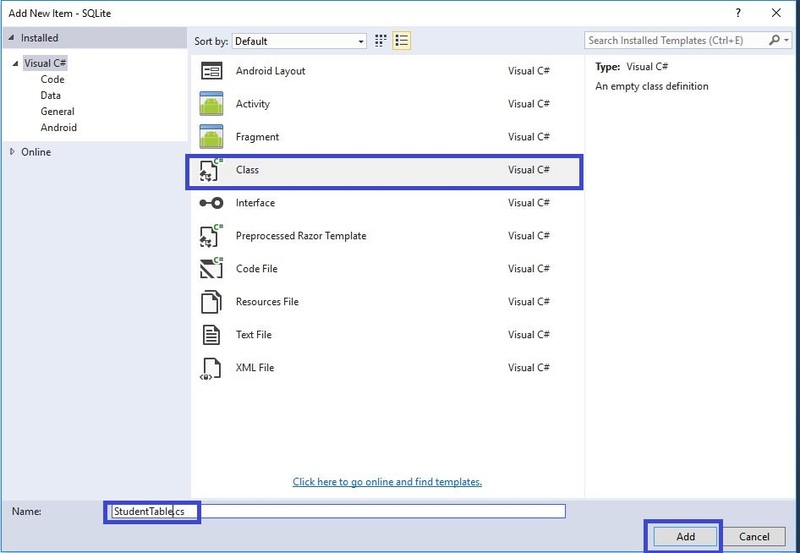 Step 10: Open the Solution Explorer-> Project Name->InsertActivity.cs. Click Open CS code and then give it the following code. Step 11: Press F5 or “Build and Run” the Application. Step 12: Again, insert a new layout for select operations. Open Solution Explorer-> Project Name->Layout. Right click on Add and open new Dialog box. 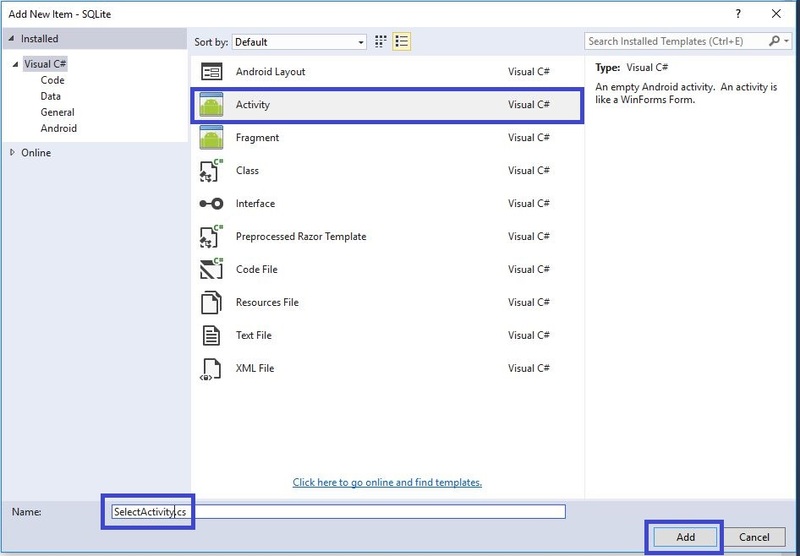 Then, select Android Layout, give it a name as Select.axml, and click on Add. Step 13: Now, go to Solution Explorer-> Project Name. Right click on Add and open new Dialog box. Then, select Activity and name it as SelectActivity.cs. After that, click on Add to add the new activity class. 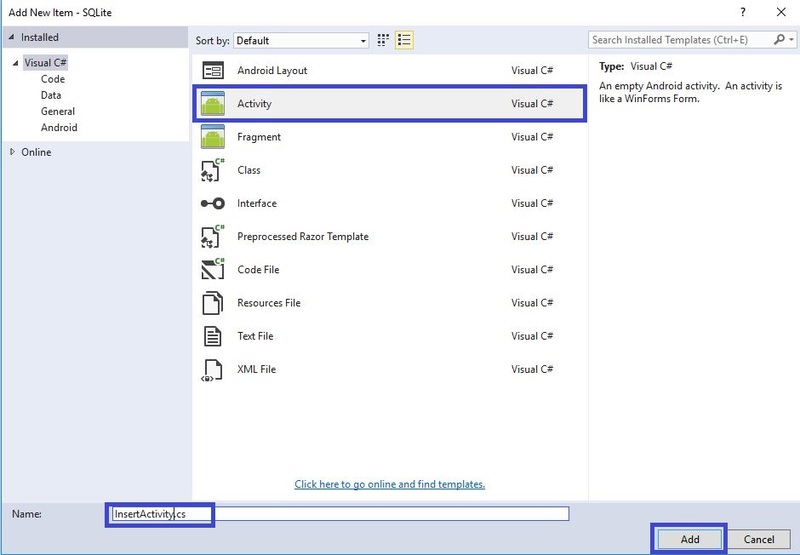 Step 14: Next, open Solution Explorer-> Project Name->Resources->layout->Select.axml. Click Open Design View. 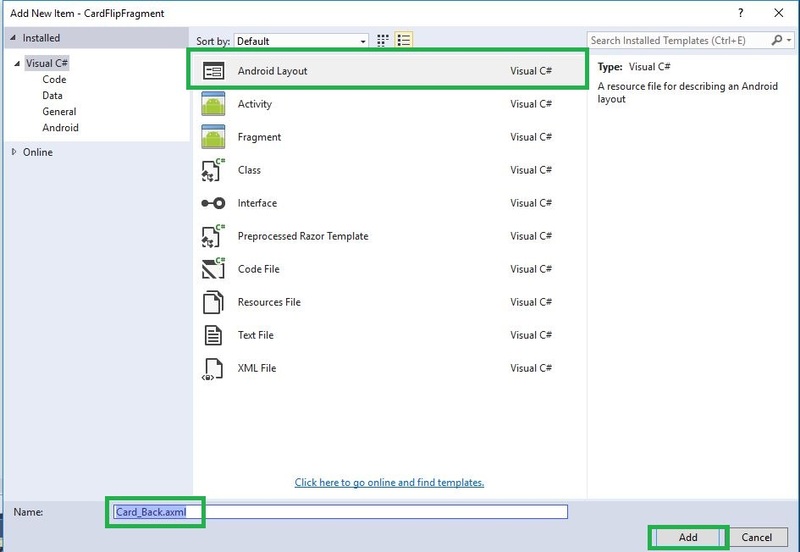 Step 15: Open Solution Explorer-> Project Name->SelectActivity.cs. Click Open CS code. Write the following code. Step 16: Press F5 or “Build and Run” the Application. Step 17: Insert new layout for Update operations. For this, open Solution Explorer-> Project Name->Layout. Right click on Add and open a new Dialog box. 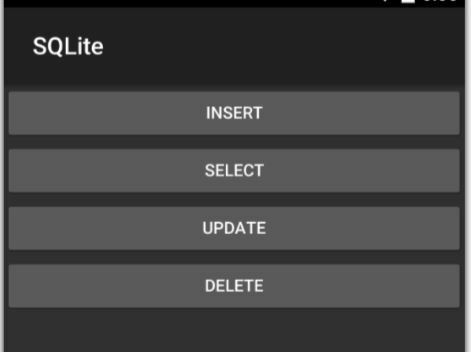 Then, select Android Layout, name as Update.axml, and click Add. 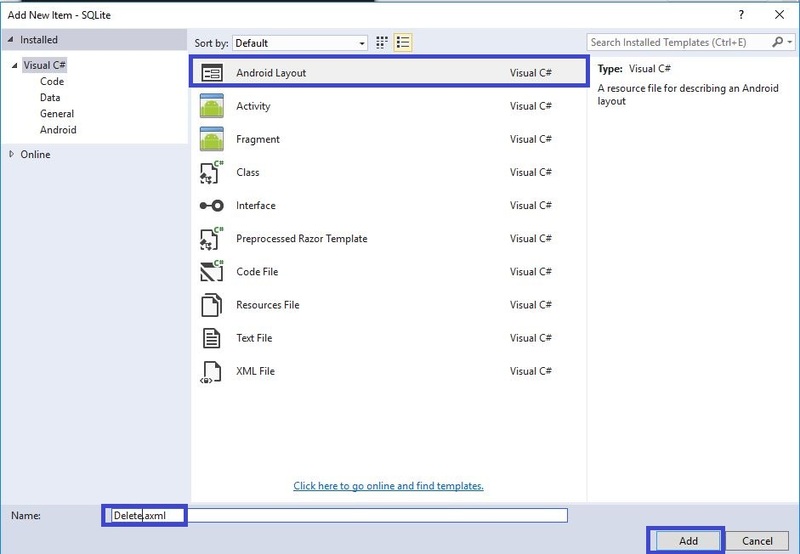 Step 18: Now, go to Solution Explorer-> Project Name, right click on Add, and open new Dialog box. Select Activity and name it as UpdateActivity.cs. Now, click on Add. Step 19: Next, open Solution Explorer-> Project Name->Resources->layout-> Update.axml. Click Open Design View. 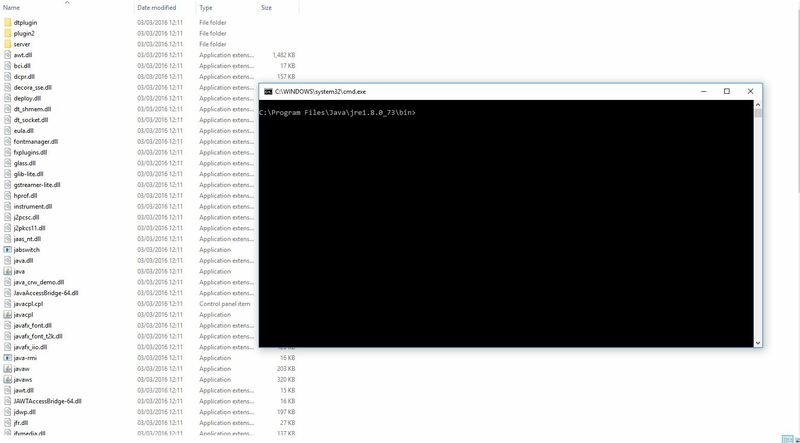 Step 20: Open Solution Explorer-> Project Name-> UpdateActivity.cs. Click Open CS code and give the following code. Step 21: Press F5 or “Build and Run” the Application. Step 22: Insert new layout for Delete Operations. Open Solution Explorer-> Project Name->Layout. Right click on Add and open new Dialog box. 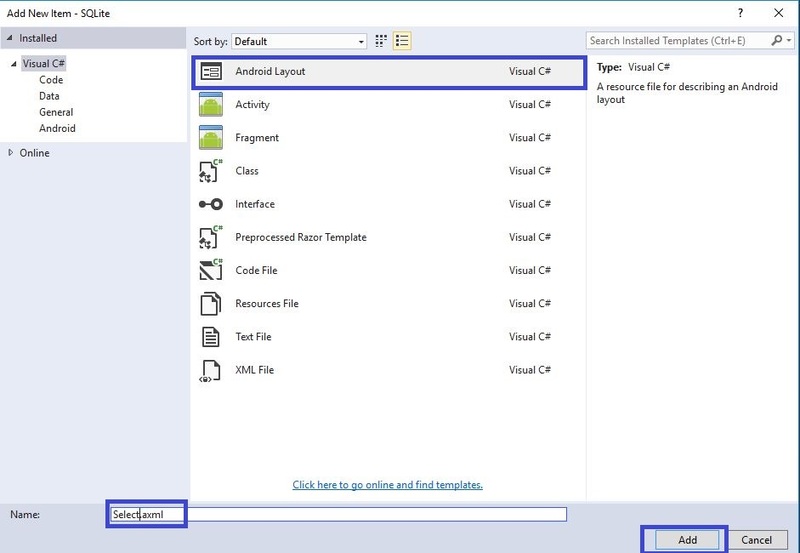 Then, select Android Layout and give it a name, Delete.axml. Just click Add. Step 23: Now, go to Solution Explorer-> Project Name. Right click on Add to open new Dialog box. Then, select Activity and name it DeleteActivity.cs. Simply, click Add. 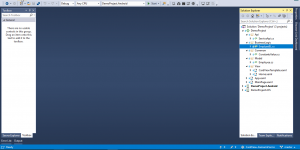 Step 24: Open Solution Explorer-> Project Name->Resources->layout-> Delete.axml. Click Open Design View. 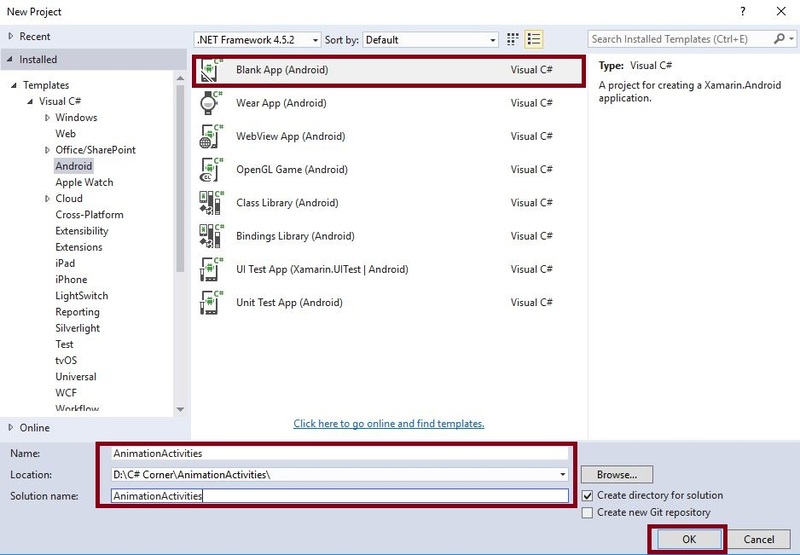 Step 25: Open Solution Explorer-> Project Name-> DeleteActivity.cs. Click Open CS code. Then, give the following code. Step 26: Press F5 or “Build and Run” the Application. 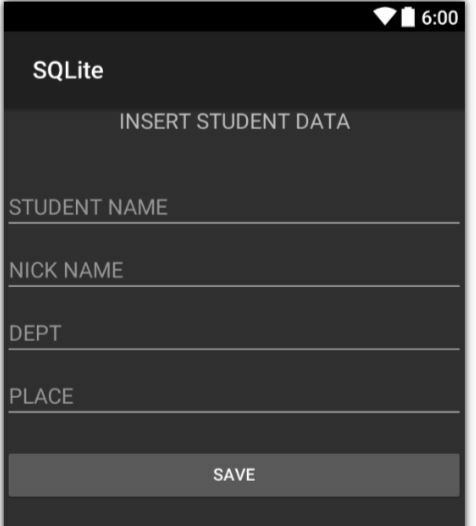 Finally, we have successfully created Xamarin Android INSERT, SELECT, UPDATE and DELETE operations, using SQLite Database.